This may not be a surprise to most of you, but Maine is absolutely gorgeous. At least in August. I don’t even want to think about winter there considering I can barely keep myself out of a seasonal depression funk in New York come January and February. Spending this past weekend there with a great group of food & fitness bloggers on behalf of Cabot was one of the highlights of my summer so far. We all participated in an application process earlier this year to become a part of the Cabot Fit Team which included an entry into the Beach to Beacon 10k race, lodging for the weekend and the opportunity to visit one of the 1200 farms that are part of the Cabot cooperative. When I got the call to say I was selected to be part of the team my emotions were a mix of excitement and “oh crap, guess I need to start running!” I knew it would be fun, but honestly, I never expected it to be as great of a weekend as it turned out being. 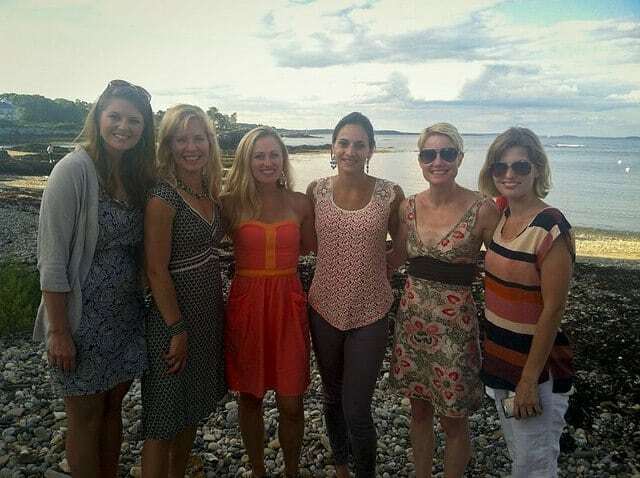 Thursday night, we attended the opening ceremony of the race on the gorgeous Maine coastline where we got to meet the founder of the Beacon to Beacon race, gold medal Olympian Joan Benoit Samuelson and hear the race director, Dave McGillivray (who is also the race director for the Boston marathon) speak. Friday morning we were up early to attend the press conference for the race where we were able to meet all the elite athletes running and competing for the prize money. Beach to Beacon is a relatively small race (about 6,000 entries) but it’s incredibly popular having sold out in 4 minutes this year. The pool of elite athletes running it is impressive for it’s size. Ryan Hall, Meb Keflezighi and Deena Kastor were some of the elites competing this year. After the press conference we headed out to a nearby farm that is part of the Cabot cooperative. We got to meet their 25 cows (note to self: do not stand too close to the back of a cow. They’re large animals and their pee is equally as “large”), 2 goats and multiple calves. We ate lunch at their house on a picnic table and learned a bit about the milk to cheese production. It was really neat to see the source of the stuff you buy in the grocery store and know that a small family farm of 25 dairy cows could be in that block of cheese you just threw in your shopping cart. One of the cool things about the Cabot cooperative is that they work with small farms all over New England & New York to produce their product. 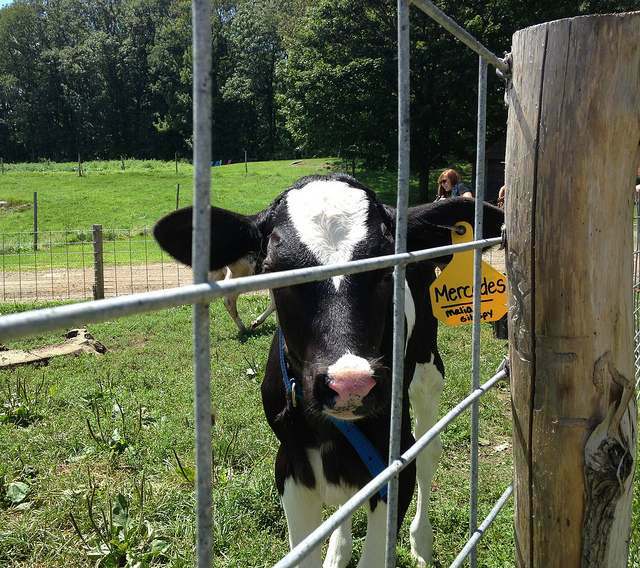 In fact, on the trip this past weekend, I learned that a farm I frequently buy cheese at just 5 minutes from my house just signed on with them! Saturday morning came bright and early as we made our way to the race start at 6am. For the past 2 months, the weather has been so unbearably hot & humid that I really had no expectations for this race. My training was pathetic and I never ran any of my long runs without stopping multiple times for either water or out of boredom because I was forced inside on the treadmill. So I threw any and all expectations of myself out the window and decided to just run and enjoy it. Well, Saturday morning turned out to be perfect for running. I’ve never been so psyched for clouds and 60 degree temps. It was a beautiful course and even though there were definitely some rolling hills, I felt awesome. I ran the course without walking and managed a 55:27 finish time. 8:55 pace according to the race, 8:50 pace according to my Garmin which said I ran 6.27 miles not 6.2. Either way, I’ll take it considering what my “training” ended up being. It’s a bit frustrating to know I used to run 30-45 seconds per mile faster but I’d much rather be where I am now with CrossFit at the expense of some speed than a speedier runner without the strength gains I’ve made over the past year. 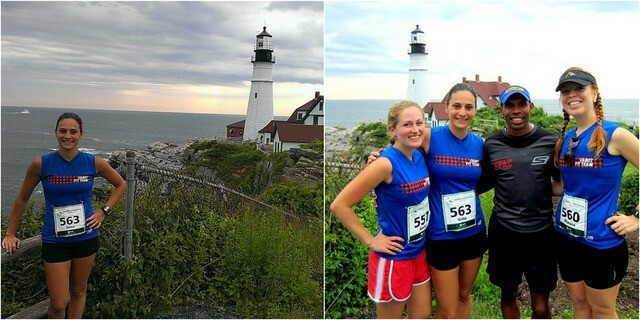 After the race, Anne, Monica and I went to check out the lighthouse and literally ran into Meb doing his cool down. I can’t say enough nice things about Meb. He was a truly sincere and nice person recognizing us from the press conference the day before and stopping his cool down run to talk to us and take a picture. It was very cool to interact with a guy you’ve only seen through your tv screen in the front of the pack of the NYC marathon and realize how down to earth and genuine he is. Meb came in 5th in the race with a finish time of 28:37 (4:37 pace). So basically, he was done when I was about 3.2 miles into the race. Ha! 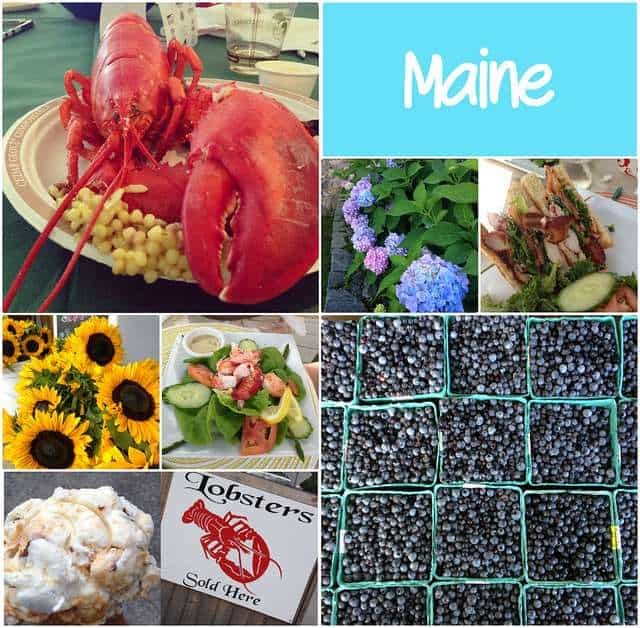 Saturday night we attended a lobster bake with some of the best lobster I’ve ever had. At $4/lb in Maine, I think I’d be eating it daily if I lived there. The night and weekend ended with a build your own s’mores platter at the hotel and some fun conversation with some great new friends. Thank you so much to Cabot for this opportunity! *Cabot Creamery selected me to be a part of their Cabot Fit Team. With that, I was given a free race entry, lodging and travel reimbursement. This is not a compensated post, all content and opinions are my own. Philadelphia half marathon race recap and new PR! That’s an awesome time considering you haven’t been running much! Don’t be so hard on yourself :) Love shady cool mornings for running…luckily enough they’re nearly all like that in Ireland! I giggle every time I watch that video of Katie! Such a fun trip, I wish we could do things like this more often! Loved, loved the recap of the weekend. Knowing it was one of the highlights of your summer is actually really heartwarming to me (I know… that sounds corny. Maybe I haven’t had enough coffee this morning and am kinda sappy). But seriously… our farmers work so hard and we’re thrilled that we could host this opportunity on their behalf. Last feel good comment of the day – your comment about your time being higher, but your overall strength being better is so spot on. I’m a big fat loser in the fitness department compared to your teammates, but I’m increasingly aware that fitness isn’t about one number, stat or measurement. It’s a way of life and deserves a well rounded approach. It really was such a great experience meeting the farmers and learning about Cabot. I can’t say enough great things about the company, it’s employees we spent the weekend with, how they work with their farmers and how involved they are in the local “scene”. It’s so refreshing as we all know that’s not the norm unfortunately. Thanks for all the support you and everyone else on the Cabot team has shown the “fit team” over the past few months! OMGosh – a 4:37 pace – that.is.insane! I bet his cool down run is faster than my fastest pace! ha!! And … $4/lb for lobster – insane again! I can’t even buy chicken for that price. BTW – I came to you from Fannetastic Food’s blog. Great recap. I read three now and even though you have some similarities, you each also hit on different perspectives. Great reads! This looks like an awesome weekend! What a cool opportunity, you lucky duck!! ;) Well done on killing the 10k! 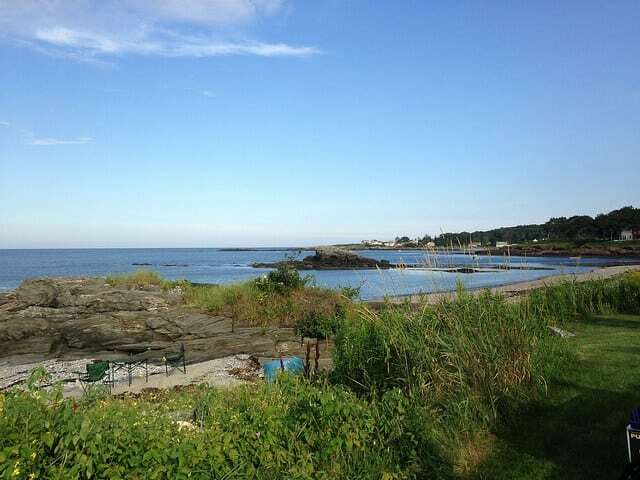 Maine is so beautiful! We took a family trip there years ago, and I’ve been jonesin’ to go back ever since. Great post:) I love your description of the events. And the warning about the best place to stand in the barn. Lol:) I can’t stop thinking about that lobster from Saturday night. I am ready to go back!! haha yes! I learned my lesson from standing too close to the cows behind. Yikes! Really nice to hang out with you Gina! This post makes me so excited for my upcoming trip to the East Coast of Canada – thanks so much for sharing!! What a beautiful place to run. I’m with you on the speed/strength compromise. Doesn’t it feel great to recognize the gains for which you’ve worked so hard?! It was a hot summer leading up to the race, so I think all of us suffered a little on the training. You still rocked it and it was such a blast.